Knowledge@Wharton’s technology and media editor, Kendall Whitehouse, recently returned from San Diego Comic-Con and provides this perspective on recent trends in media marketing at the annual pop culture fest. Comic-Con International: San Diego is many things — a pop culture convention, an opportunity to purchase action figures and rare comic books, a place to don your favorite superhero costume, and a scene to spot celebrities. It’s also a major marketing event for movie, television and publishing companies. Site-specific marketing installations — known as “activations” within the industry and frequently referred to as “offsites” by Con goers since they occur outside the official Convention Center activities — fill all the available spaces in San Diego’s Gaslamp Quarter. These experiential marketing events share a common goal: to get fans excited about upcoming media properties. Media company representatives frequently speak of their objectives in terms of “immersion” and “engagement.” They seek to envelop fans in the brand experience and have them actively involved with it. How to achieve these two aims — and stand out from the crowd of competitors with the same goals — is less clear. Over the years, various approaches to capturing buzz at Comic-Con have risen in popularity, only to be later eclipsed by new trends. Although VR was big that year, some companies embraced a counter trend to offer distinctly un-virtual thrills. To promote its Gotham series, Fox Television let fans ride down a zipline set against a large cutout of the Gotham City skyline. That year also saw the Assassin’s Creed video game franchise encourage fans to navigate a physical obstacle course that included leaping from a high tower into an inflated stunt airbag. In 2016, USA Network’s Mr. Robot television series created a detailed reconstruction of the show’s mid-1990s computer repair shop and the present-day apartment of the show’s protagonist, Elliot Alderson. Once in the apartment, participants donned VR headsets to embark on a 13-minute VR experience — that begins and concludes in the same apartment in which they are physically located. Last year, the Blade Runner 2049 Experience offered an elaborate hybrid virtual/real activation. The experience began in a 4D theater motion-controlled seat that provided physical effects synchronized with a 3D movie in which the viewer pilots one of the film’s flying “spinners” through the Los Angeles of 2049. After pursuing a rogue spinner, both vehicles crash to the ground — an experience made visceral by the vibrational feedback of the seats. Once you removed your VR headset, the wall previously in front of the theater was gone. In front of you was a full-scale model of the crashed spinner. Ahead, you entered a 12,800-square-foot reconstruction of a future Los Angeles street scene, populated by a dozen or so actors sporting costumes from the film. A recent trend in evidence at this year’s San Diego Comic-Con places fans in a show-themed escape room, with puzzles that need to be solved to complete the adventure. In addition to featuring a room filled with 1980s video games and entertainment such as an air hockey table, foosball and arcade video games such as Joust (echoes of Flynn’s Arcade! ), the final room of the Ready Player One Experience included a (fairly trivial) 1980s trivia contest that led to a final clue to exit the room. 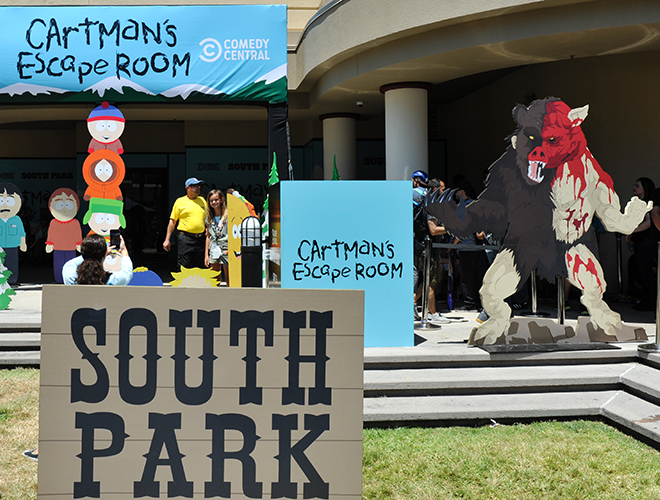 Over at the South Park Experience, Cartman’s Escape Room featured a far-from-trivial escape room with a series of complicated puzzles. According a staff member, only about 15% of the teams solved all the puzzles. Another variation moves the puzzles out into the world at large, sending fans scrambling around the city to find clues. When closely tied to the narrative of the show being promoted, these comprise an alternate reality game or ARG. At last year’s San Diego Comic-Con, Mr. Robot featured an elaborate ARG that led fans who could decipher the clues into a special experience linked to the television show’s storyline. An often-stated goal of activations is to immerse the participant inside the world of the movie or television program, whether it’s by playing video games in Tron‘s Flynn’s Arcade or piloting a spinner through Blade Runner‘s future Los Angeles. “We’re literally putting people inside the cartoon” with the South Park Experience, according to Chris “Crispy” Brion, creative director at South Park Digital Studios. Compared to video games where the player picks from a list of canned response options, Brion’s aim is to “let you tell your own story within the world” of South Park. Given these varied approaches to creating a buzz-worthy experience, what should a marketer do to stand out from the crowd? For Amazon the answer is apparently “everything.” To promote the series Tom Clancy’s Jack Ryan, debuting August 31, Amazon Prime Video employed myriad approaches combined into a single, large-scale event. 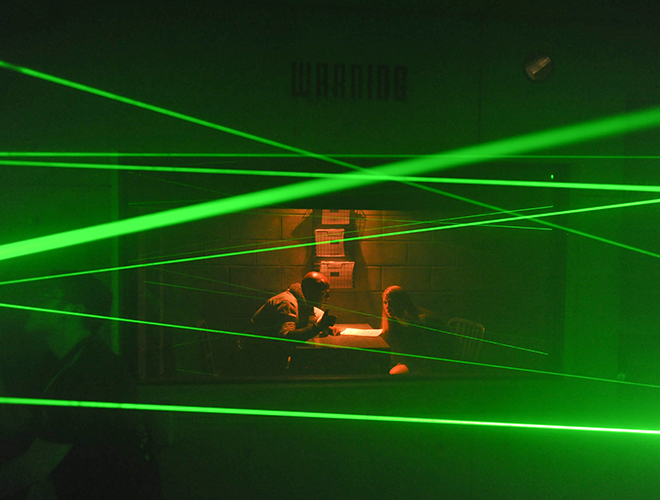 Described in a press release as “the world’s first hyperreality spy experience,” the mammoth activation presented an array of features: an expansive show-themed physical environment, an escape room experience that included falling money (some of it real), a room webbed with lasers, and a hybrid real/virtual experience that had participants repelling out of a full-scale replica of a helicopter approximately 30 feet in the air while wearing a VR helmet. On the twin dimensions of immersion and engagement, the Jack Ryan Experience pushed the dials of both to 11. 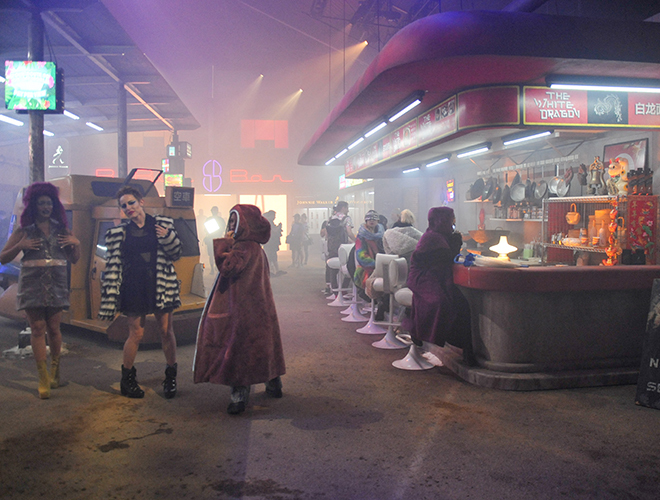 Much of the activation’s 60,000 square feet evoked the show’s Middle Eastern setting by presenting an extensive bazaar. After checking in as an “analyst” and getting your official-looking ID badge, you could browse market stalls displaying colorful fabric and exotic spices. You could also get free water and ice cream. More foreboding looking were the mysterious crates, black barrels and boxes of military MRE’s (meals, ready-to-eat) placed around the open spaces. 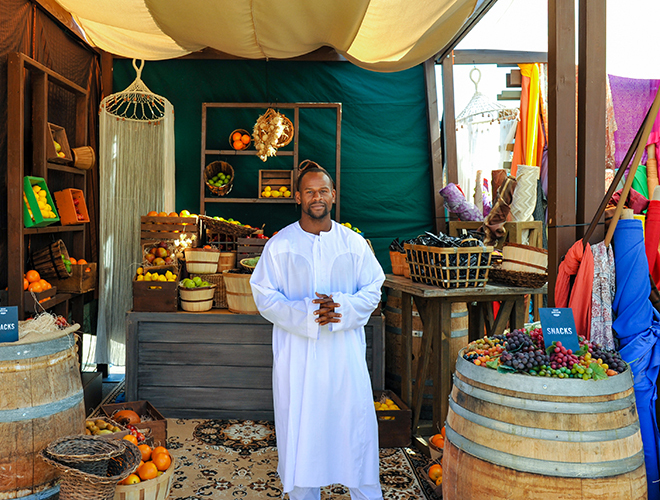 Actors portraying field operatives would challenge participants with scavenger hunt style “mini-missions” throughout the bazaar. At the perimeter of the bazaar were two major experiences: the Jack Ryan Dark Ops Experience escape room and the hybrid virtual/physical Jack Ryan Training Field Experience. The Dark Ops Experience was a group exercise for teams of eight members. At the outset, the team I followed was advised, “If you see real money, take it.” Money, we were told, would be falling during part of the experience — some of which is fake and some of which is real. Apparently previous teams were unsure whether it was appropriate to keep the money. We were assured it was. This was an activation with the best giveaway of all: cash. At certain moments inside the escape room the team received advice from the (pre-recorded) voice of Jack Ryan himself, as portrayed by the show’s lead actor, John Krasinski. At other times the team communicated over a videophone to a live actor portraying a government operative. And, since the show is on Amazon’s video service, the company’s Alexa virtual assistant played an important role as well. In addition to the pressure of trying to decipher the clues, the physical environment itself was unnerving. Lights would go out, fans would blast air, and — yes — money flew down from the ceiling. In the penultimate room of the experience, one of the team members was taken away into an interrogation room. The room, already filled with a smoky fog, suddenly went dark as a web of green laser beams filled the room. It was, in a word, intense. It was certainly both immersive and engaging. The team eventually made it through, although the team’s time of 17.01 minutes failed to beat the then record of 10.20 minutes. The team I accompanied did, however, grab a total of $72 in cash from the money fall, which was split evenly among the team members. On the opposite side of the market was the most visible attraction of the Jack Ryan Experience: the Training Field. 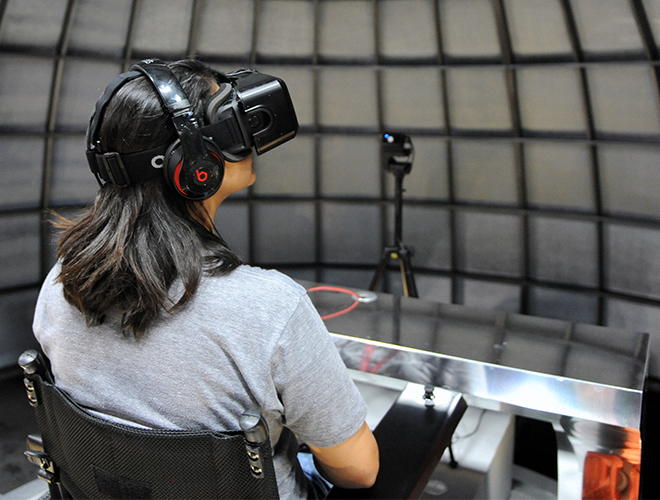 A full-scale reproduction of a helicopter perched atop a tall building marked the first phase of this multistage experience that blended VR and the physical world. 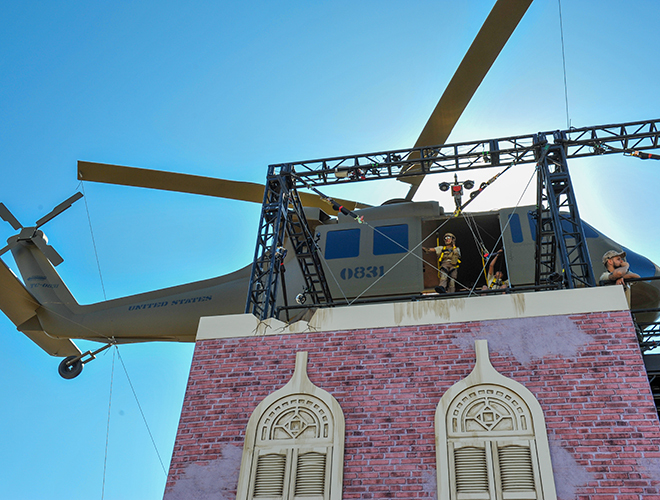 After climbing the scaffolding to reach the helicopter, you were outfitted with an Oculus VR helmet and equipped with motion tracking technology. Within the VR experience, you’re high on a rooftop in Yemen. In the real world, you grab the rope, exit the helicopter, and are lowered down to the next level of the building. Within the VR you’re repelling from the helicopter high over Yemen. You next walk along a narrow plank which, inside the VR, is precariously perched several stories in the air. The actual plank is, of course, on the floor of the building, but it’s intentionally not seated firmly, so the plank wobbles as you attempt to cross it. The next section involves a firefight with enemy forces that requires you to use night vision. You’re then attached to a zipline to fly down to the ground. Finally, you drive a military vehicle through the dessert to complete your mission. 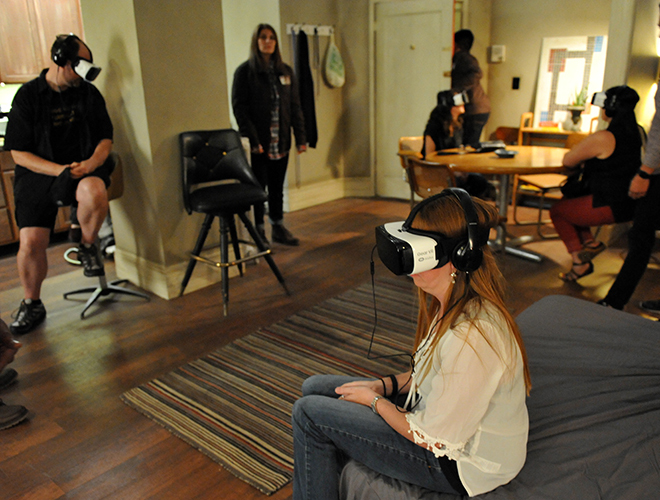 All of this occurs while you’re immersed in the universe of the show through the VR headset. 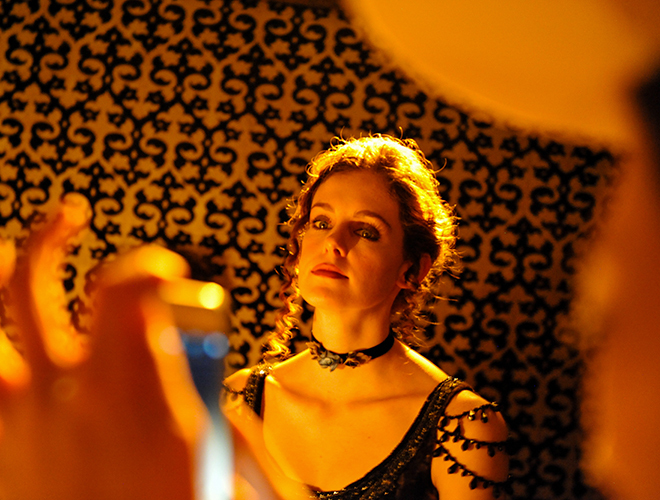 Throughout the experience, actors portraying your fellow operatives are barking commands. 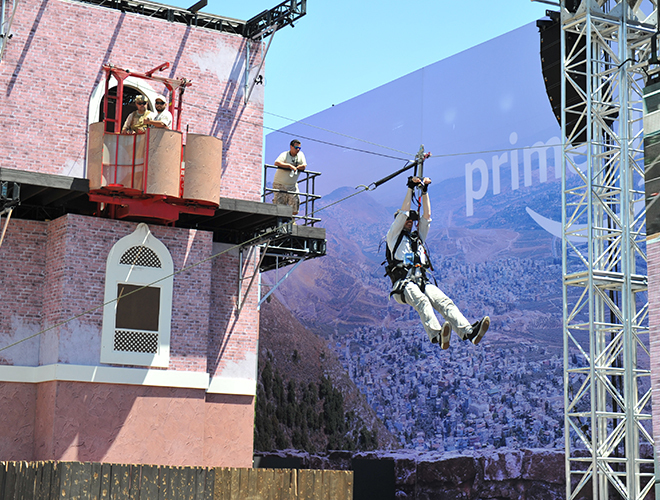 “It’s the first zipline in VR,” I’m told by Chris Byrne, director of U.S. partnerships and production at MediaMonks, the digital production company that developed the Training Field Experience along with Amazon Prime Video. Almost as an afterthought he added, “And the first helicopter jump in VR.” No doubt. While exclusivity creates a certain buzz as fans scramble to gain a prized ticket to the event, there is a downside to mounting a large event seen by only a few. “One of the problems [with developing an elaborate activation like Jack Ryan] is you spend all this money and only a few people experience it,” noted Byrne. While he declined to say exactly how much money went into creating the experience, Byrne gave an indication of its scale by noting that a staff of 350 worked on the project for three-and-a-half months. The Jack Ryan Experience implemented multiple approaches to address the conundrum of scale versus reach. The bazaar setting extended outside the fenced-off perimeter of the main activation, allowing anyone walking by to interact with actors in character or rest in the shaded seating areas. Giving Con-goers a comfortable place to rest for a few minutes is a much prized — and all too rare — feature at Comic-Con. After returning home, as the thrills of Comic-Con were fading into memory, I received an email from Amazon’s Prime Video with the subject, “You have new assets.” Inside, links to a series of videos of my team going through the Dark Ops escape room provided one final touchpoint of engagement. 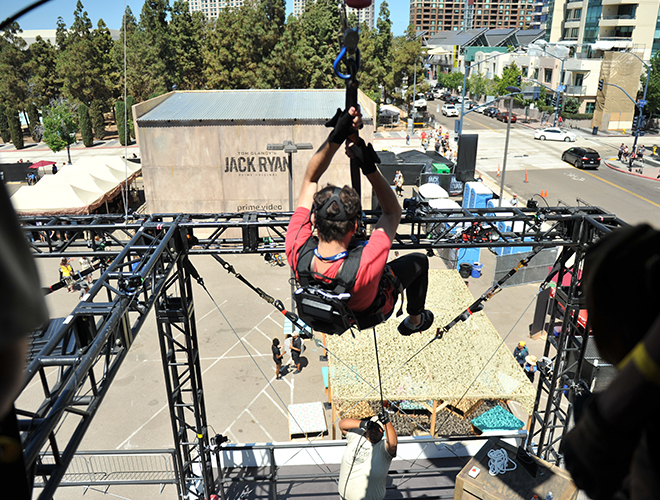 The Jack Ryan Experience set a new bar for site-specific marketing experiences. Michele Bisard, the fan from Michigan, said it was the best offsite she had experienced in her four years at San Diego Comic-Con. As companies strive to outdo each other to create the most talked-about event at Comic-Con each year, it will be difficult to beat Amazon Prime Video’s Jack Ryan Experience. I look forward to seeing how they attempt to do so next year. See Whitehouse’s Flickr account for a photo gallery of the Jack Ryan Experience and other activities at San Diego Comic-Con 2018. For more reports on Comic-Con and popular culture, see On Technology and Media: Reports from Comic-Con.